-Obtain a long-term residence permit. 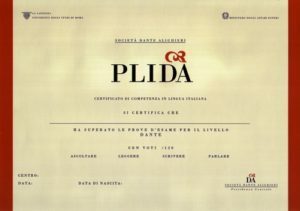 The PLIDA certificate is an official Diploma issued by the Società Dante Alighieri under an agreement with the Italian Ministry of Foreign Affairs and the University of Rome La Sapienza. It is recognized by the Italian Ministry of Labor and Social Policies and by the Italian Ministry of University and Research as a qualification for the proficiency in the Italian language for foreigners. For each level there are four sections, one for every linguistic skill; Listening, Reading, Writing, and Speaking. To pass the exam and obtain immediate certification, you need to achieve a minimum of 18 out of 30 points for each of the four sections. If you do not pass all sections, you have a year to repeat any single section in other scheduled exam sessions. All candidates can choose the level that they consider as closest to their level of skill: it is not necessary to have taken examinations at lower levels in order to enroll for a given level. Examinations at several levels can be taken during the same session. PLIDA exams are open to all: however it is advisable to contact us for information regarding preparation for the exam. Exam sessions are organized to take place on predetermined dates, which apply to all Centers. The oral examinations will be held in the days immediately following the written test. The exams papers are sent from the various Certification Centers to the Central Offices, where they are evaluated within 60 days from the date of receipt. The certificate indicates the candidate’s details, the level, the marks obtained in the four language skills, and the overall mark. Can understand the main points of clear standard input on familiar matters regularly encountered in work, school, leisure, etc. Can deal with most situations likely to arise while traveling in an area where the language is spoken. Can produce and comprehend simple connected points on topics which are familiar or of personal interest. Can describe experiences and events, dreams, hopes and ambitions and briefly give reasons and explanations for opinions and plans. Can understand a wide range of demanding, longer texts, and recognize implicit meaning. Can express him/herself fluently and spontaneously without much obvious searching for expressions. Can use language flexibly and effectively for social, academic and professional purposes. Can produce clear, well-structured, detailed text on complex subjects, showing controlled use of organizational patterns, connectors and cohesive thoughts. For each level there are four sections, one for every linguistic skill; Listening, Reading, Speaking and Writing. ID is required to take PLIDA Exams. 4050 West Maple Rd – Suite #250 | Bloomfield Hills, MI 48301. On the day of the written test, candidates must arrive at least 15 minutes in advance of the start time (9:15 am for a 9:30 am test) and present a valid government-issued photo ID. You can only take the exam if you register by the deadline. Candidates who are late for the exam will not be admitted. The set date is for the written exams. (listening, reading, and writing) exam time will be set at close of registration. Oral exams date will be determined for each student a few days after the written exam. Exam Fee Refund Policy: Exam refunds will be provided only until the close of registration for the exam. The PLIDA Certification of the Dante Alighieri Society is officially affiliated to ALTE, the Association of Language Testers in Europe. PLIDA becomes part of the European association that since 1989 promotes multilingualism in Europe, establishes the standards of linguistic assessment, promotes the quality and ethics of language testing and groups together the linguistic certifications recognized as valid in Europe. Affiliation is an important recognition of the work and quality of PLIDA.